As you connect with these sacred Crystal Medicine Oracle you will be taken on a potent journey of self-empowerment and mastery. These 33 magical cards work on all levels of your being, mind, body, and spirit and apply 5 different aspects of medicine, making them holistic in their application and approach. The first aspect of the cards is the oracle or essence, which is then backed up by an ancient Earth medicine and a crystal that align to the energy and meaning of each card. The gorgeous images have been channeled and infused with energy and medicine for the soul. This deck is unique in that it also offers a ceremony that allows you to integrate and embody the energy for a deep and potent healing experience. Also included is a beautiful color booklet that offers an abundance of shamanic wisdom. 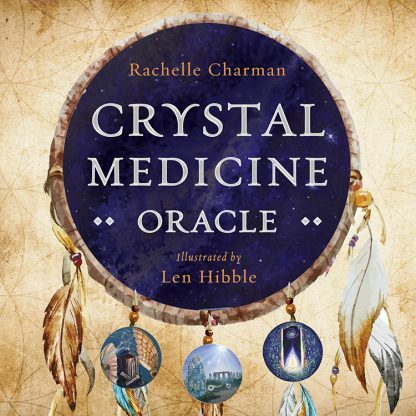 Rachelle Charman is the founder of the Academy of Crystal Awakening in Australia and the author of Crystals, Crystal Reading Cards, and Chakra Reading.